TRAIN YOUR CAT OR KITTEN TO USE THE LITTERBOX AGAIN! Dr Elsey’s Cat Attract Litter™ is used when having problems with cat and kitten training box training. This new scoopable litter provides a solution for cat owners whose cats, or kittens, do not use their litter box. Great for training kittens to use a litter box! This new scoopable litter provides a solution for cat owners whose cats do not use their litter box and are urinating or marking around the house. Blended with a natural herb attractant, Cat Attract’s herbal scent, ideal texture and particle size combine to solve litter box problems. Non-use of the litter box is the number one reason a cat is abused or finds itself in a shelter. Dr. Elsey’s Cat Attract Litter™ is the first cat litter to specifically address problem cats. It is also an excellent litter for getting kittens off to a good start with their litter box habits. 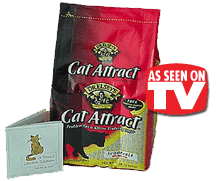 Dr Elsey’s Cat Attract Litter™ comes in a flexible, easy to pour cube. It is easy to carry and easy to store. Furthermore each box also contains a free booklet to help cat owners solve their litter box problems. Thank you so much for recommending the new Dr Elseys Cat Attract Litter…My cat, Nemo, was so interested in it that he actually slept in the new litter when I filled the new box! I had a hard time getting him out of it! He was definately attracted to it. One of the other benifits is that when I scooped the box for the first time, it was so easy. It clumps wonderfully and there is absolutely no odor! I would like to re-order another bag, and will never purchase “Generic” litter again! Thank you for helping me escape the “Planet Urine”! If anyone has questions about this product or would like to know more, feel free to give them my email address. I RECEIVED YOUR DR ELSEYS CAT LITTER THIS WEEK, SHE WENT IN HER BOX THE SAME DAY. YOU GUYS ARE AMAZING!! Dr Elsey's Cat Attract Litter™ is used when having problems with cat and kitten training box training. The new scoopable litter that provides a solution for cat owners whose cats do not use their litter box!